This is just a little tip that I've been wanting to share. I am a huge fan of cilantro. It's one of my favorite herbs. It's useful to have in your kitchen at all times! It has a wonderful flavor, adds great color as a garnish, and truly "completes" many dishes just by sprinkling a few chopped leaves on top. I don't think I ever eat a taco without it! 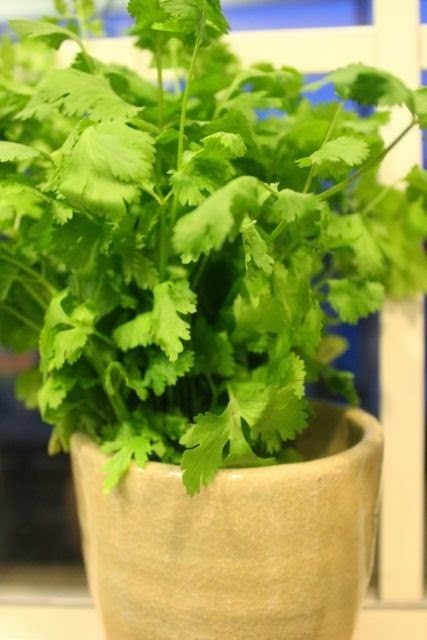 But cilantro doesn't often last very long (as most cut herbs don't). I've tried growing it in an herb garden, but it's not an herb that keeps growing new leaves like basil, for example. So I find it best to just buy it in a bunch at the market - always smelling it to make sure it smells fresh before adding it to my shopping bag (a little trick I learned from my husband). To keep my cilantro fresh all week long, I treat it like fresh-cut flowers! 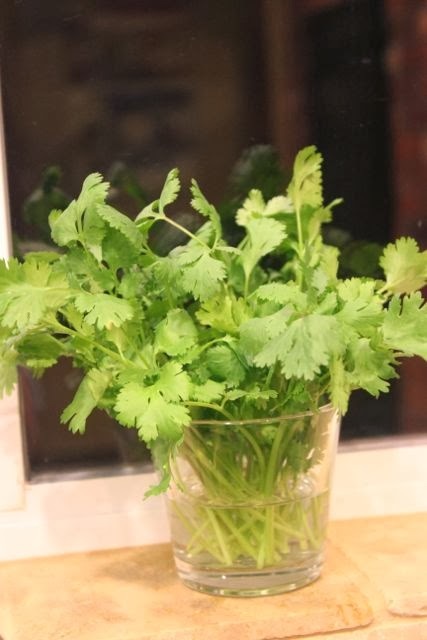 Remove the tie that holds the bunch together, snip off the stems about 1/4 inch and place the fresh cut stems in a glass with fresh cool water. Replace the water each day to keep the bunch fresh and remove any wilted or dried stems. Hope you find that this little tip works for you too!